Back in the 1990s Jill and I operated our own small press publishing company and, at that time, there weren’t millions of authors self-publishing their books, there weren’t services where you could buy editing, book design, production, or any of the essential services that are readily available to us today. That’s because books were almost exclusively produced and published by large publishing companies, university presses, smaller independent publishers, and that’s about it. During that era, the weekly issues of Publisher’s Weekly were required reading for just about everyone in the book publishing business. Sitting in our spare bedroom, running what was basically a one-man publishing company, PW seemed like a beacon on a very distant hill in a faraway country. We were so small and insignificant, there was no reason for the powers that reigned in the industry to even notice we were there. So you’ll understand just how excited I was when I was contacted by Adam Boretz, editor of PW’s BookLife section devoted to self-publishing, who invited me to become a columnist in the PW Select section (where self-published books are reviewed) of the print version of the magazine. Over the months since then I’ve been pleased and honored to contribute to the outstanding editorial content put out by PW every week. “With more and more authors taking the production of their books into their own hands, more and more of those books look… strange. That’s not a good thing for either authors or their readers. “Author platforms: we’re still talking about them because they’re such a crucial part of introducing new books and new authors to a wider readership. And, for indie authors, having a robust author platform can mean the difference between giving up your day job or staying put for a while. “It’s great to see authors start blogs to help them build robust author platforms. Authors can write articles, create attractive sites, and post all their book and publicity information in one place. But too often this strategy just doesn’t work, because if you want people to visit your blog, you’re going to have to market your blog. “Blogging, which started out as a simple way to post online personal journals, is now all grown up. Bloggers move opinions, appear in other media with regularity, build huge communities of like-minded people, and go on to become authors, too. Do you have a subject you’d like me to cover in an upcoming column? Or here on my blog? Let me know in the comments. 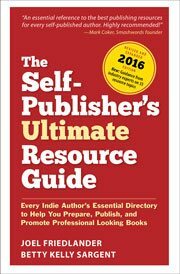 My next article for PW will be on “Book Design Options for Self-Published Authors”—watch for it. While it’s possible to read PW for free online, the print edition has ads that are not online. The ads from the big pubs provide important information and stimulation for small pubs, suggesting activities that we should emulate or avoid. Thank you so much for the free 24 page guide! !